I can’t help noticing that when traffic is relatively light, this sign on Kings Way always it’s 4 minutes to Williamstown Road. This seems as optimistically unlikely as those old Citylink travel time promises. Google Maps reckons it’s 7.7 kilometres, and estimates a travel time without traffic of 6 minutes. The speed limit along the freeway and over the Westgate bridge is 80 km/h, which by my calculations makes it just under 6 minutes if you were able to consistently do the speed limit for the whole distance. To do it in 4 minutes you’d need to be zooming along at about 115 km/h. The estimate to get to the Western Ring Road seems a little more accurate. Of course the very reason these signs are needed is because travel times on the roads can vary widely. In peak hour they are crowded and slow… in a city the size of Melbourne, this is inevitable, because it’s simply not efficient to move people in ones and twos in their cars. In a big city I contend that it’s probably not possible to fix road congestion. But is it possible to reduce overall average travel times for everyone (not just motorists)? Well yes it is. Vancouver’s managing to do it. How? By not building motorways, but upgrading public transport instead. The more people are off the road, the better. Next → Next post: Why does the government want to kill Community TV? How would VicRoads calculate the estimated travel time? Is there like a fixed distance registered and when the operator clicks on ‘light’ or ‘almost no traffic’ the system automatically calculates the distance for X-km/h? I guess the operator may just select the average speed of vehicles over a section and does a distance to km/h calculation each time? Maybe you should report it to Vicroads. Your photo got published in The Age online today. Well done. Also saw you in a 5 second grab on the TV news last night. You provide a good balance to the usual pro-road groups. There is a bit of good info here in section 4.2 in how the colours and travel time are estimated/managed which is based around the detected speed at the various loops or studs imbedded in the road surface on the mainline. There is also a lot of other info in the PDF around managed freeways. There is also a fairly good video explaining the basics of the freeway management system. As to the question at hand it does seem there is something wrong with the displayed travel time at that location for that section of the freeway network. I actually think this one may be something to do with the system set-up. i.e. its treating the whole Kingsway viaduct as an entry ramp prior to the merge near the Ingles Street bridge and thus the travel time is from the mainline entry point and they haven’t correctly allowed for the ramp travel time. Almost all other ramps in the system would have a negligible travel time when ramp signals are non operational and thus an allowance is only made when the ramp signals are in operation. Kent Acott from ‘The West Australian’ has recently had a series of articles on his visit to Vancouver. The aim was to contrast Perth and Vancouver, cities of similar size and growth but who took different transport paths. The series was in part inspired by the increased traffic congestion in Perth. It has been an interesting read. It could be estimating the time to Williamstown Road in Port Melbourne, instead of the other Williamstowon Road in Yarraville. Oh and to further support my theory that its measured at the merge point. From the ramp metering stop bar near Ingles St to Wiliamstown Road is about 5.5km which should take around 4mins @ 80kmh. The roughly 2km between there and kingsway would add another minute and a half or so (which I don’t think is being added/allowed for). Generally curious as to how the graph would look if those upgrades weren’t built? Av. 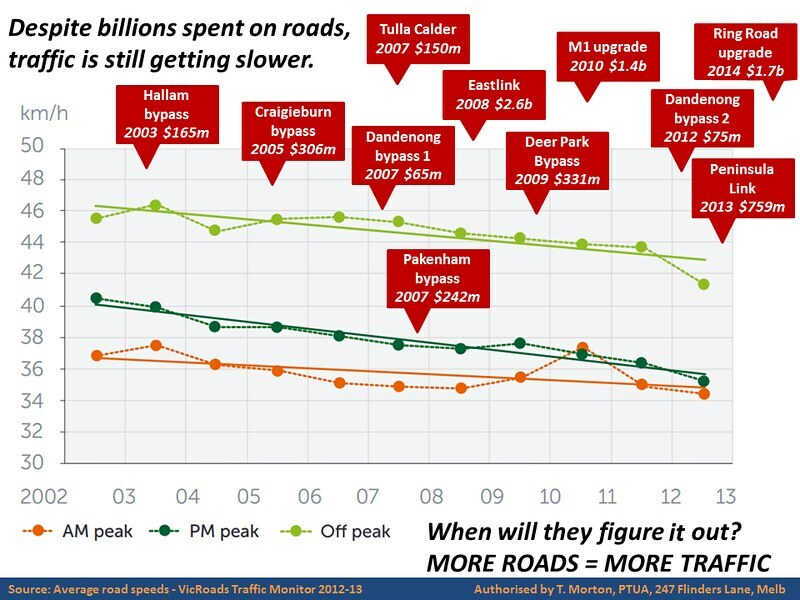 speeds appear to have dropped 2-4km/h over a decade, but I imagine would have fallen much more dramatically if nothing was done? Particularly given (I’m guessing) many more motorists have entered the network since 2002. If however, the ~7.5 billion was spent on new PT infrastructure/upgrades would that have resulted in the same 2-4km/h decrease across the road network – that is, increasing population + better PT = more people on PT & less on roads? @AustinM, what you say makes a lot of sense! @Max, the Westgate freeway doesn’t intersect/interchange with Williamstown Road in Port Melbourne. @Dave, there reaches a point where roads are congested enough that nobody new starts making trips to join that traffic; eg the traffic induced by road expansion doesn’t occur. Those people either don’t make those trips (eg they elect not to take that job across town), or they do them at different times (travel when less congested) or they find other ways of doing them (bike, PT, walk). One of the central claims from road builders is that if you don’t provide new road space, extra traffic will keep being added anyway, so the traffic keeps slowing down. That’s not really the case. A prime example is the CBD. Some people still drive in, but that number hasn’t risen in years. The traffic still moves, slowly. The total daytime CBD population however has boomed, thanks to people living there, or coming in by train and other modes. @Dave, I don’t believe the graph would have looked dramatically different if the mega projects hadn’t been built. The bit that is missed is that *all* road journeys involve travel on the ordinary suburban and arterial roads, and that most road journeys never get off these ordinary roads. The consequence of this dominance by ordinary road journeys means that *average* must be heavily dominated by the speeds achieved on those roads. And this is why adding freeways is not helping – congestion is being driven by the increasing population density and most of the resulting traffic never goes near a freeway. It just winds up on the ordinary road network. This is why, if you want to address congestion, it would be better to spend the money on eliminating level crossings than building a major new freeway. 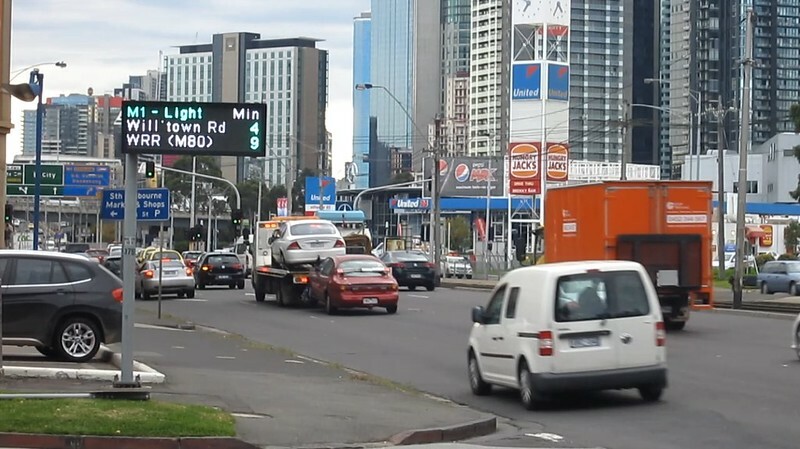 The excess capacity would be quickly used up in either case, but eliminating level crossings would improve the flow on the ordinary road network, and would do so across Melbourne. It would also spread the benefit of the expenditure across Melbourne and nearly every driver would benefit. Spending the money on a freeway, on the other hand, only benefits a relatively small number of drivers. Yesterday the travel time board on westgate(westbound) just after Todd rd, was showing just 2 mins to M80 Ring Rd in peak!